Hark! What is this I hear? A clamor? From my readers? Demanding a post before tomorrow, which starts a black out that will only end after my final on Thursday? And the dear readers want the post to be both educational, useful, AND entertaining? 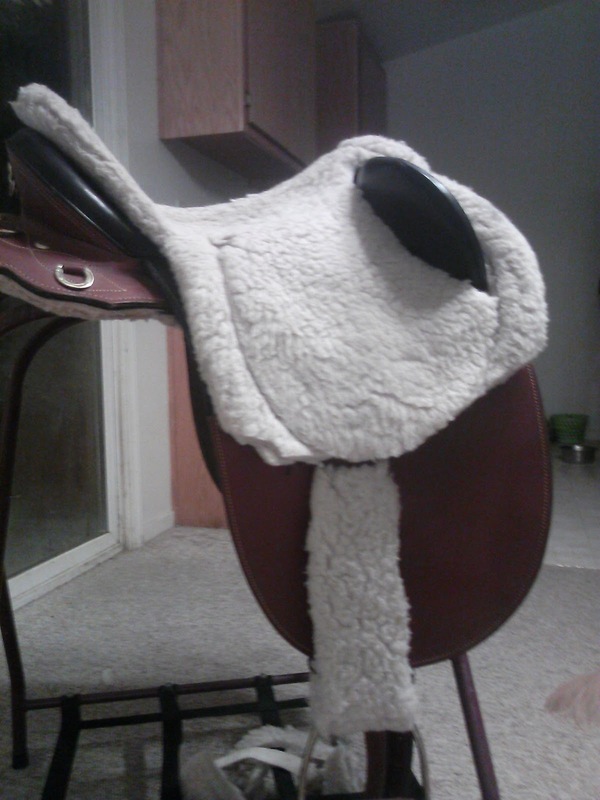 The fleece covers for my leathers have wonderful….but I need my aussie to feel a little cozier than my english saddle. After reviewing my options for seat covers, I kept coming back to the fact that I HAD a very nice full seat cover and I hated it. Never used it. Managed to sell it for the same 40 bucks that I paid for it (yes, I got a good deal, and passed that good deal along!) and have never looked back. Chances are, if I bought one I would hate it. 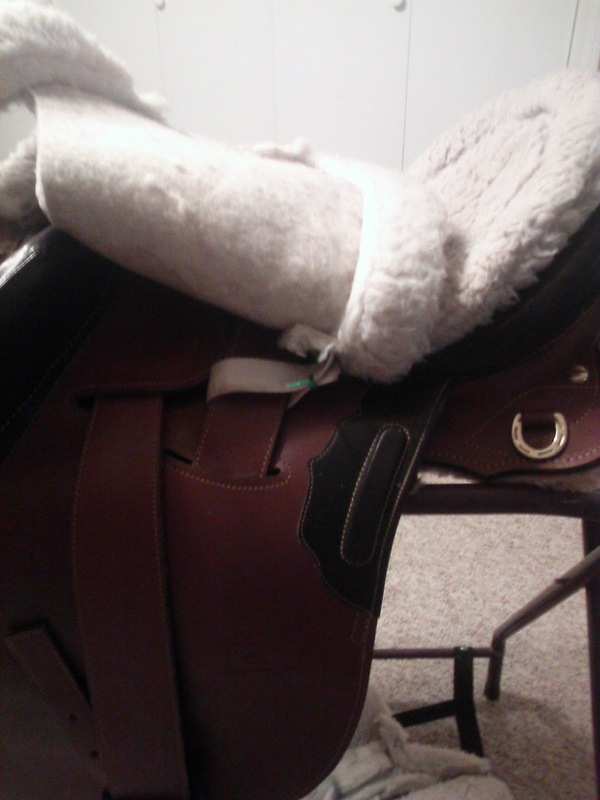 The never fit as well as you hope, my legs always feel trapped because the stirrup leathers/fenders are underneath it, they slide and bunch because the fasterns are elastic, and because I tend to grip with my knees and/or calves, it stretches, moves, and rumples up and down the flap in the most annoying way. 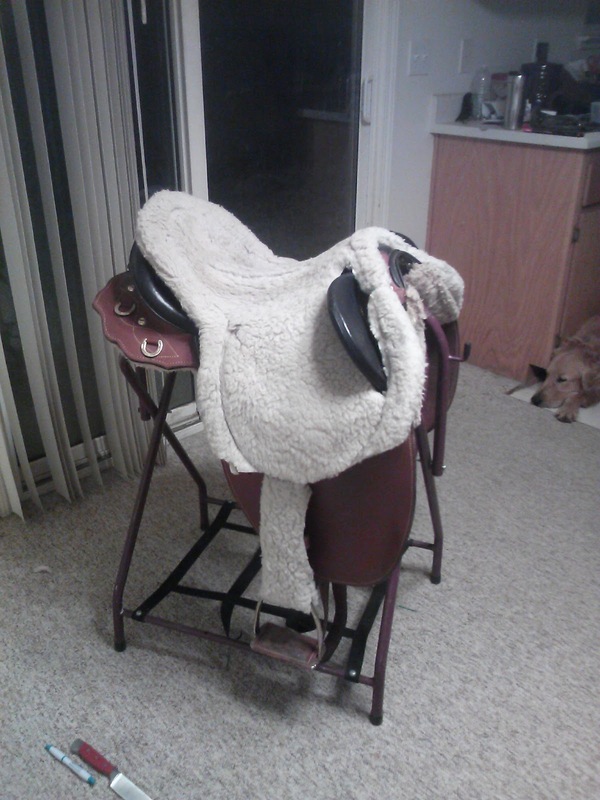 I started wondering whether I might be able to make my own……I had an older woolback pad that I bought a while ago for 30 bucks, not realizing that it won’t fit under any saddle bigger than a 16″, or a kids saddle. 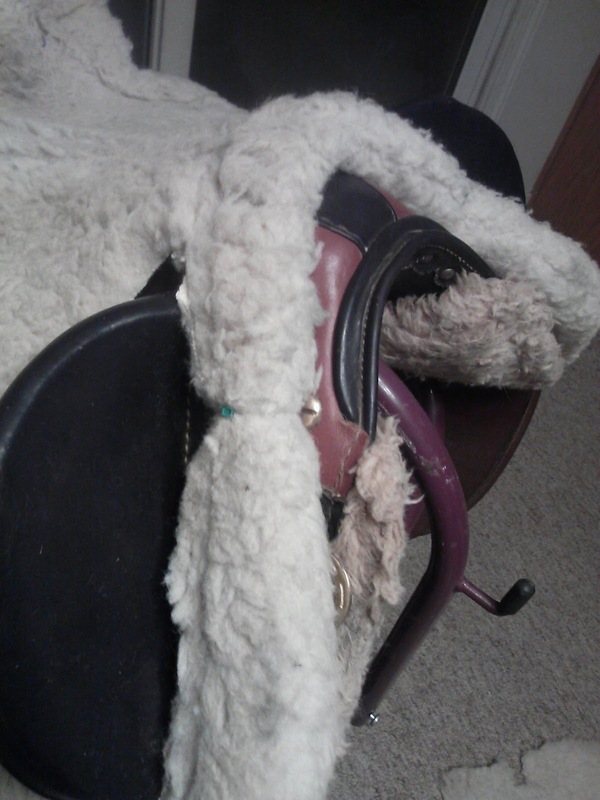 I couldn’t hardly give it away when I was selling my tack, and I was unwilling to just trash it – those old woolbacks are like gold. I didn’t have anything to lose, having stored this pad for years and years and never used it, so spent my evening and afternoon “creatively”. First I decided that the full pad thickness was too much, and have evaluating it, I realized that I could cut apart the layers. Let me tell you. The saying is that these old woolbacks wear like iron and they DO. It was all I could do to find something that would initally cut into this fabric so that my sissors could finish the job. Once that was complete, I cut holes for the poleys. 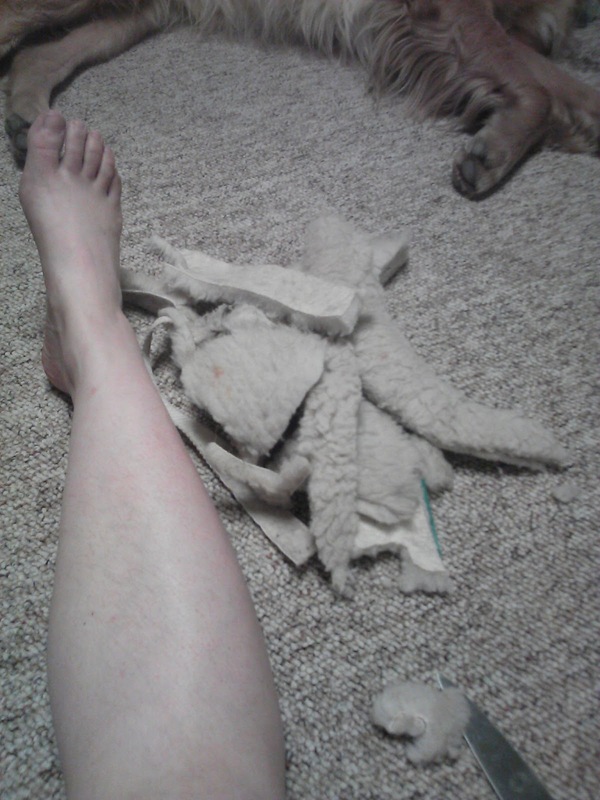 I eliminated the trim under my leg since it added bulk and a lump. 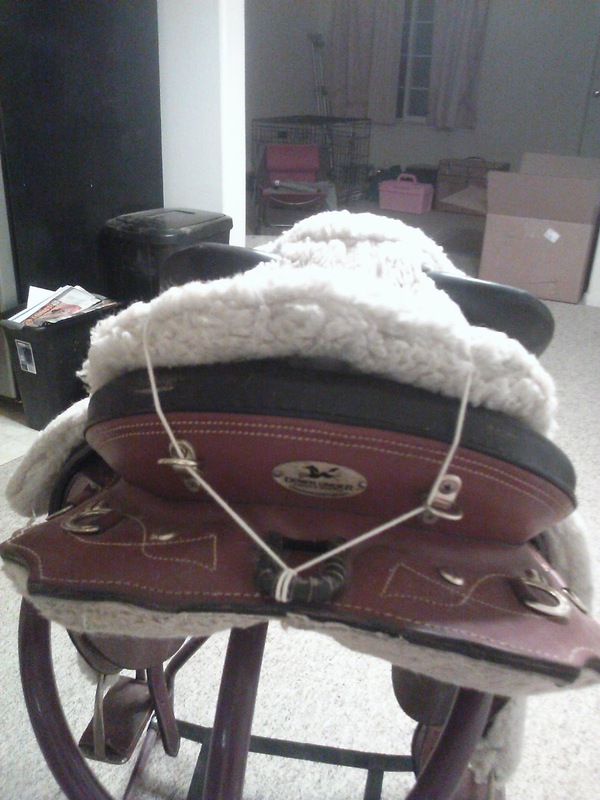 Then I started figuring out how I wanted it to attach to the saddle. I’m moving, and mostly packed, so my options were limited. 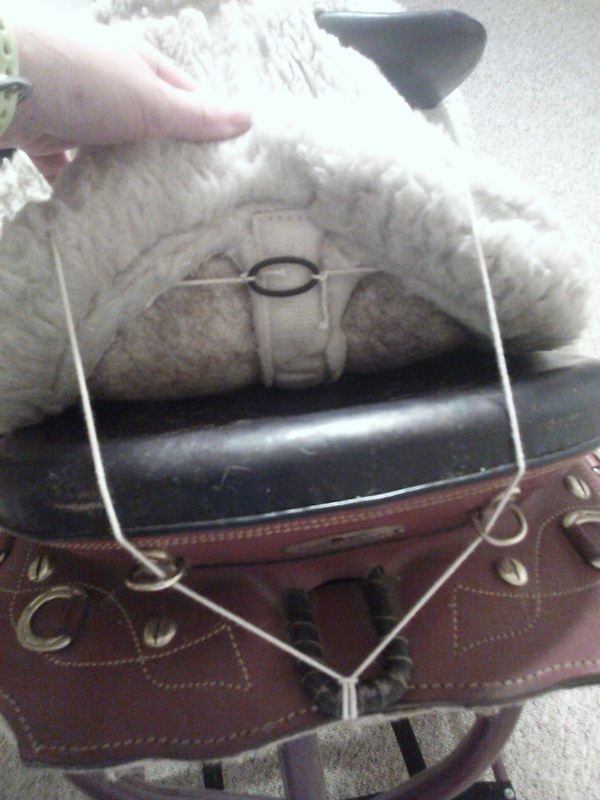 Fortunately my boot supplies are NOT packed and so I had little tiny zipties at my disposal. I can replace them in the future with something else, but in the meantime, they would be as permanant as I wanted them to be. 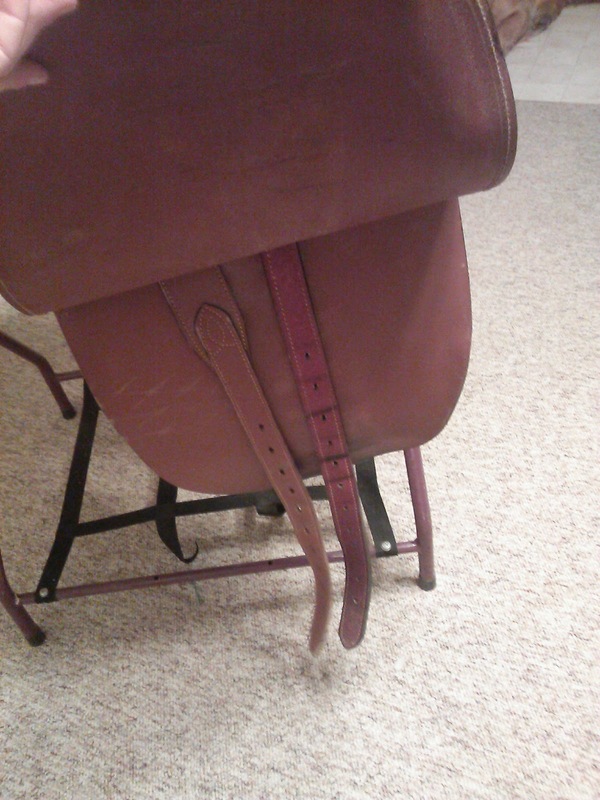 I attached the pad to the seat of the saddle by using the over girth and the last strap folded back on its self that wasn’t cut off during the modification process. 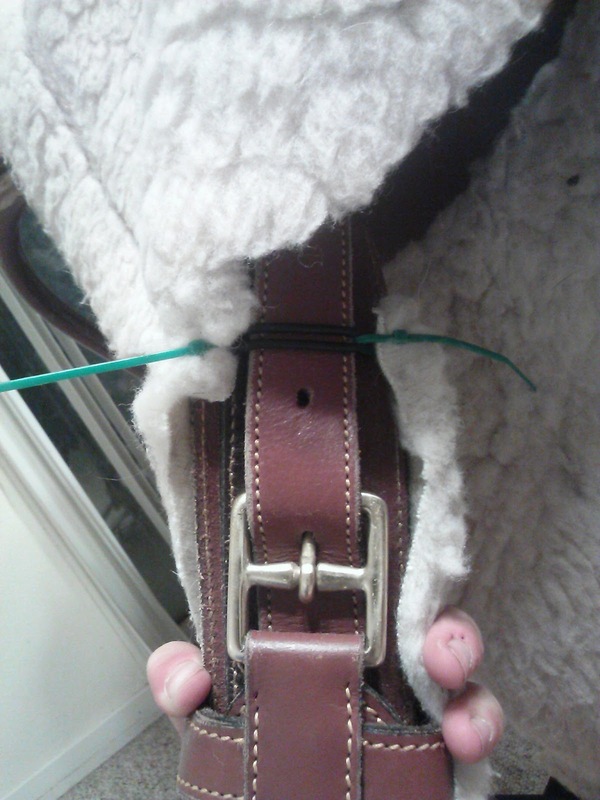 Here and else where, I made sure the that pointy ends of the zipties would neither mark the leather nor my hide. 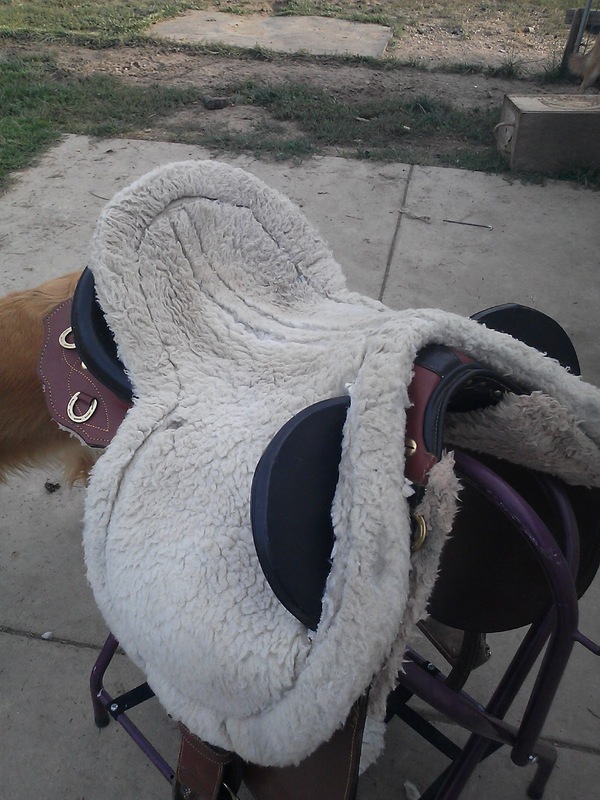 Then, I attached the pad to the front of the saddle using a set of D rings. 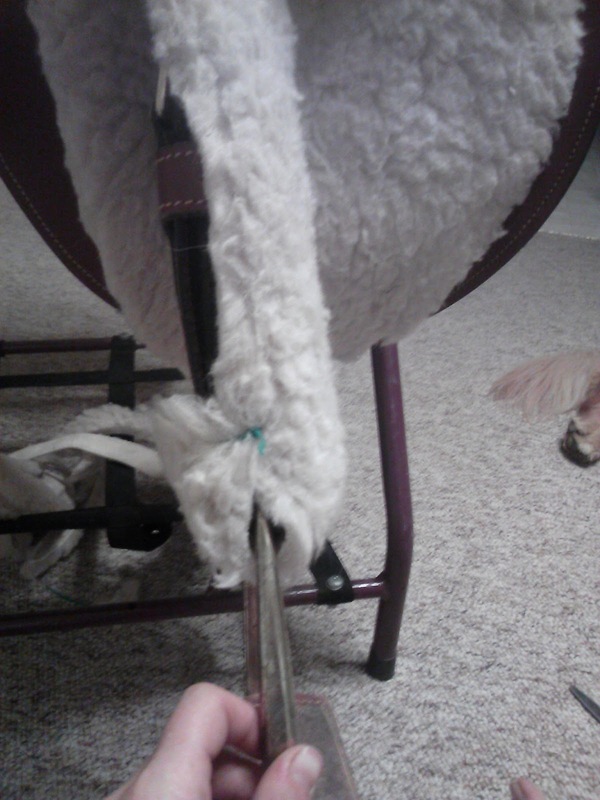 At first I attached a panel of fleece to the flap, behind the fenders, but later removed it. I can always fasten it back on for the rare ride (like a ride and tie) where I’ll be wearing shorts. Placing it UNDER the fender lets the fender swing freely and reduces the chances that the cover will be pulled in a wierd way from my leg. 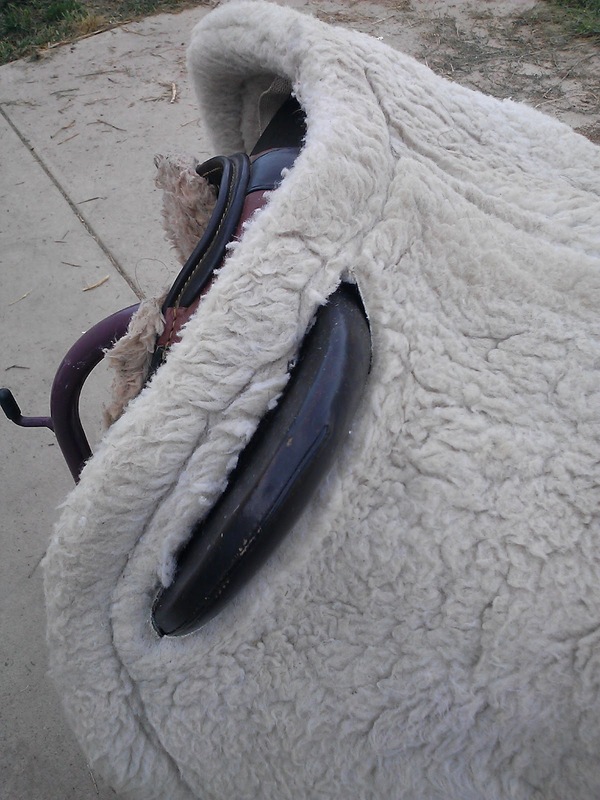 I attached a long piece of fleece to the outside of the stirrup fender, starting at the level of the end of the seat pad, and secured it at the bottom by wrapping the fleece up. The bottom is secured with zipties, the top is secured with a combination of zipties and an o-ring that provides some tension and compliance –> it should stay in place, but I can move it if I need to. 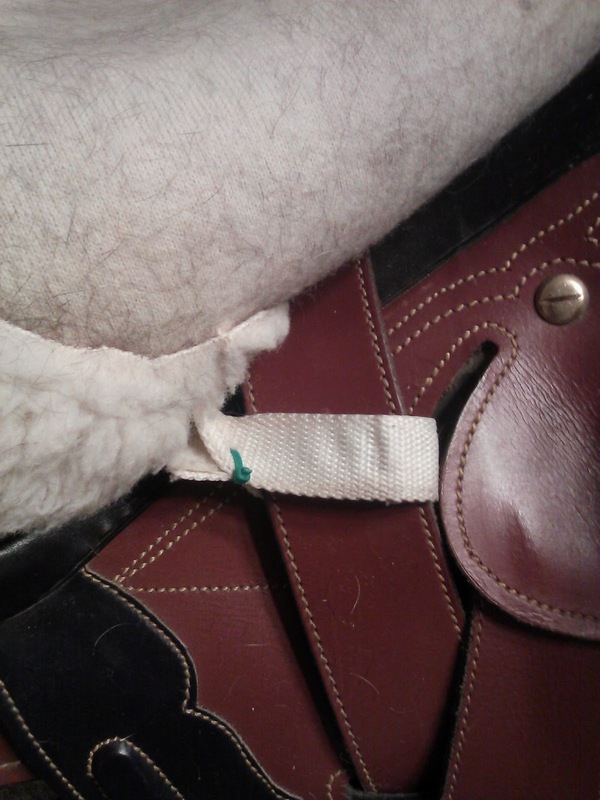 By only having the fleece on the OUTSIDE of the fender (which is the only part my leg will be touching) have have eliminated some of the bulk of having a “tube” around the leather, which will be especially important if I do ride with the “flap panel” at some point. Lasting I attached the back of the seat panel to the saddle by using a free float system utilizing a cotton stretch rotissouri truss tye and an o-ring as an anchor. 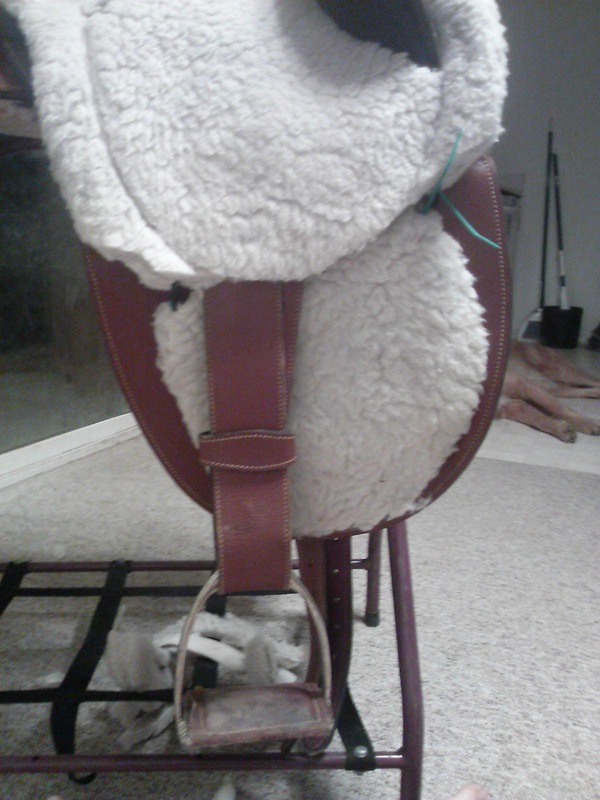 Hopefully this will keep the pad from being kicked off the back of the cantle as I swing my leg over it, but provide a enough flexibility in the system to move as needed (since the zipties are static). 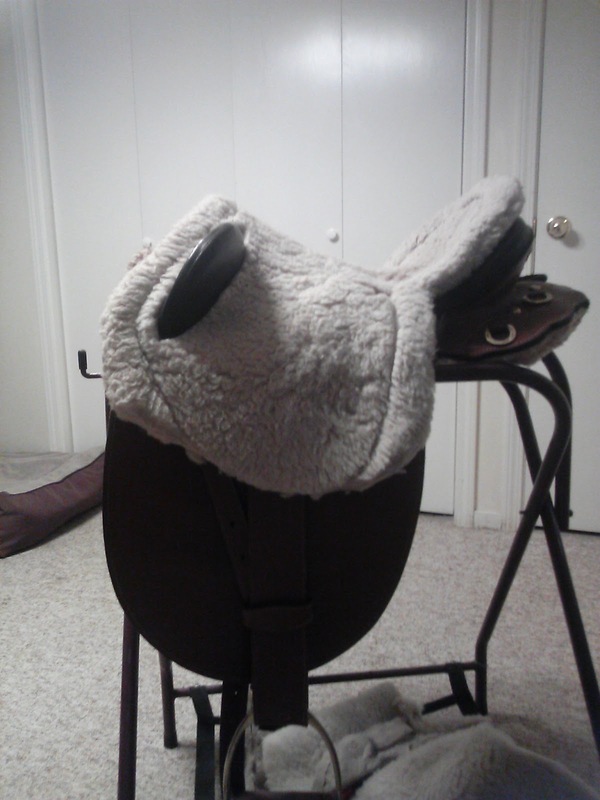 There are several advantages of this cover, including providing with full protection while still being able to cross the stirrups over the seat for easy transport, AND being able to access under the flaps and every where else I might need to for switching out leathers etc without having to take the cover off. 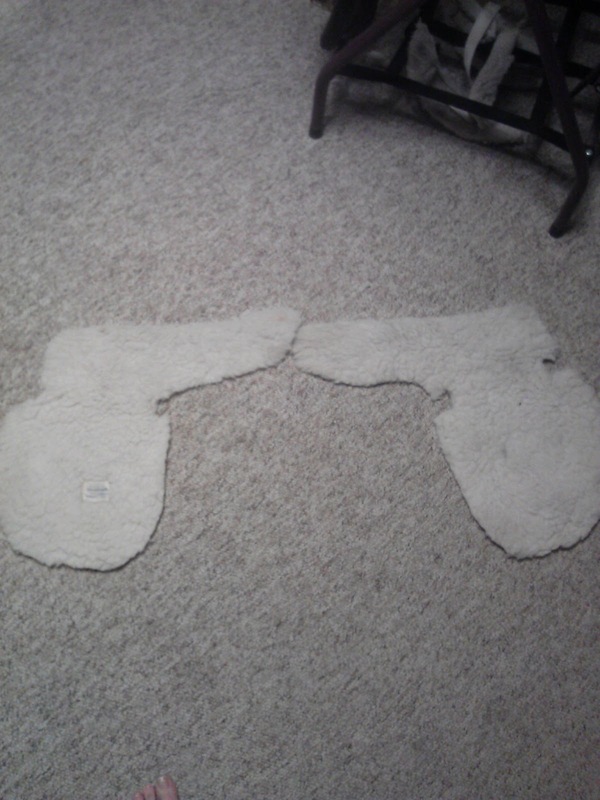 There wasn’t much left of the pad. I’m quite proud of my self. Leg looks a little less swollen than yesterday, not painful to touch at all, trots freely after me when I have a bucket of grain and doesn’t look lame. 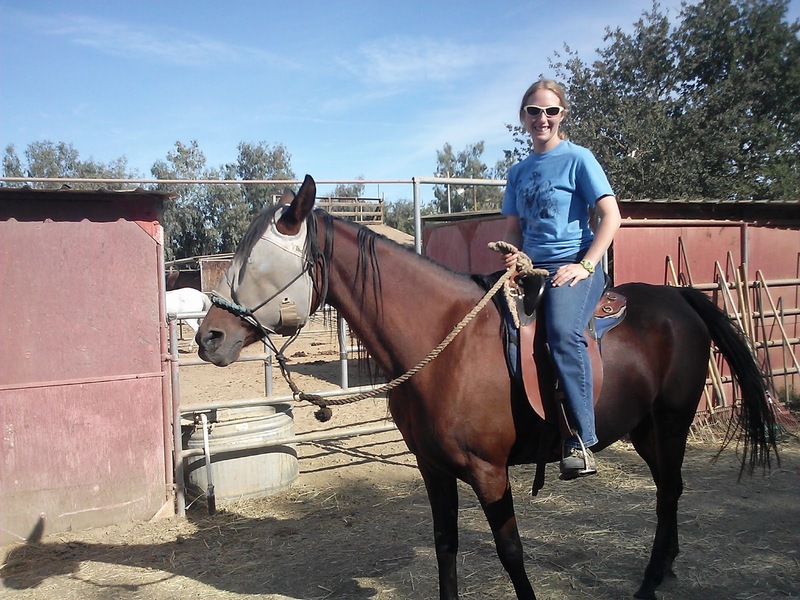 Got on her to do some more saddle fitting stuff and walked around the arena. 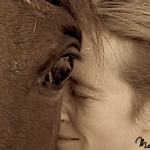 Encouraged her to trot, but she’s still a bit reluctant so I didn’t push it –> she felt even and sound from the saddle with the steps she did take. I think we are on the right track, and things are taking a turn for the better –> probably ride her lightly at a walk later this week and see how it goes. Talked to R* at the barn and she mentioned that the polo ponies sometimes do the same thing and it’s usually them hitting the pipe while kicking at flies. I think that sounds like the most logical theory so far and likely what happened. BTW – this was me “riding” Farley today –> as you might see, I had nothing serious planned, just wanted to see how the gullet/wither clearance was with my mounted. This is NOT how I dressed for my ride and tie practice today. No….for that I wore a bike helmet 🙂 (and shorts, and my barefoot, closed toe shoes (do the Keens in the above picture count as closed toed?). Keep your children away from endurance riders!!!!!! We teach them all sorts of naughty things including cutting up expensive pads for an “experiment”, letting the horse drink while hot, and that a little color is just fine. Have you competed in many ride and ties? Is the bike helmet a nod to safety? I don’t think it is rated for a fall off of a horse. It’s more for branches and the sun. the danger of getting heat exhaustion is higher than me coming off of this horse. I know that it’s rated for a different type of fall, but I can’t afford the several hundred dollar equestrian helmet that I could also run in. 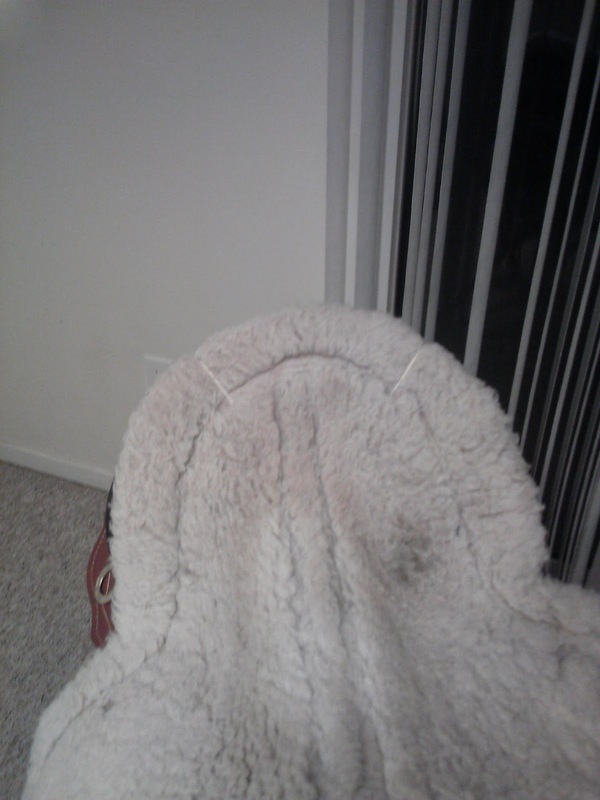 I made a seat-saver out of an automobile fleece seat cover (real fleece, skin and all!) that I bought at a garage sale for $10. 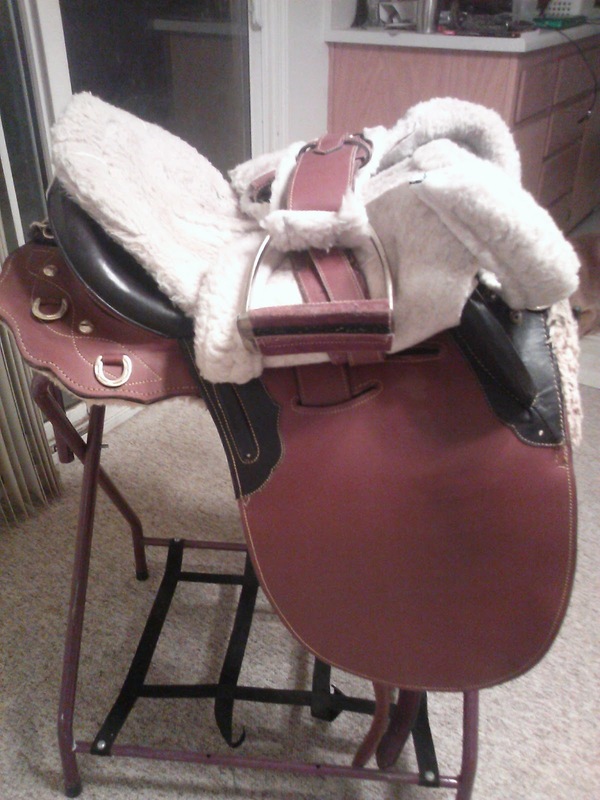 It lasted 10 years before it got threadbare, so I sold it for $10 at a used tack sale! 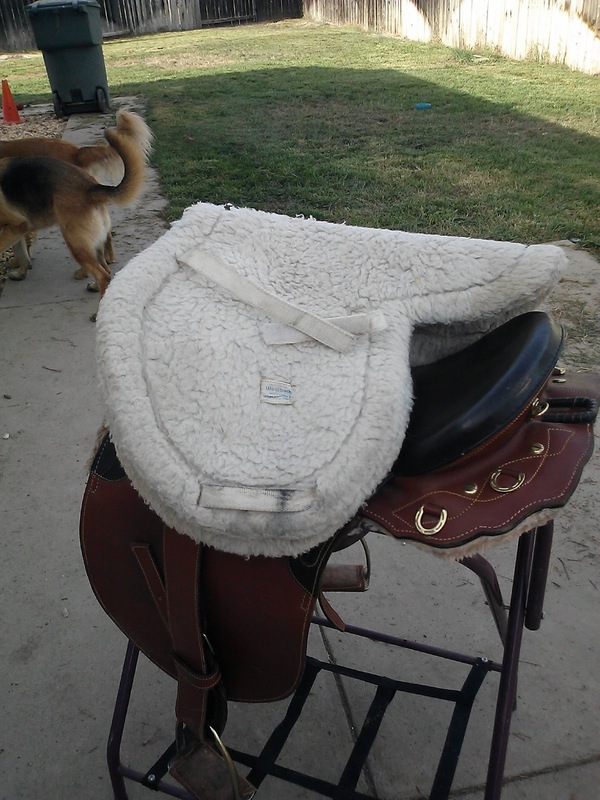 (my current saddle is plenty comfy without the fleece, so my “replacement” fleece seat saver has been in a box for the last 5 years). The bike helmet is “better than nothing” but it ISN’T rated for horses and doesn’t protect the back of your head (which is a likely impact spot from a horse-fall)…so BE CAREFUL! 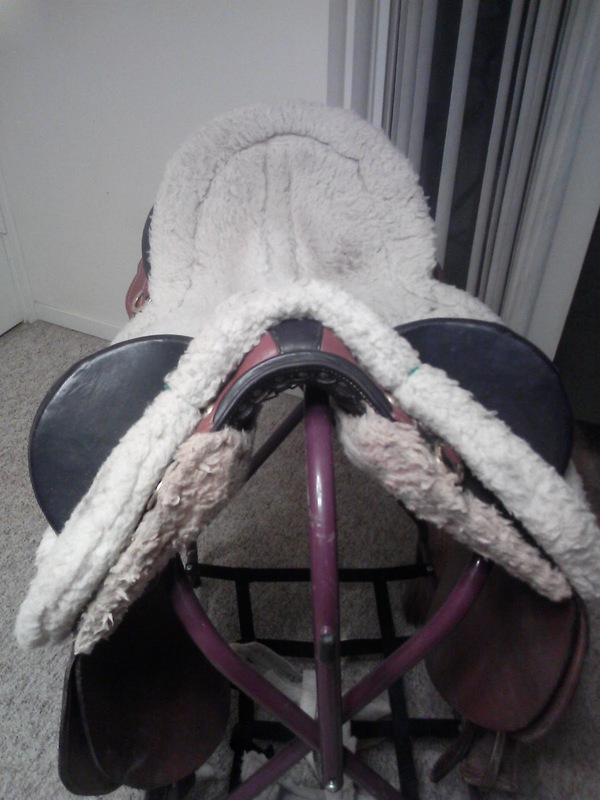 (or clip your regular helmet to the stirrup and put it on when you hop up!) We like your brains the way they are now! AareneX (and Dad) – I fully agree with you. Bike helmets are NOT an acceptable substitute for a riding helmet, something I remind parents of all the time when they tell me that they will bring their bike helmet for their kid to ride in. 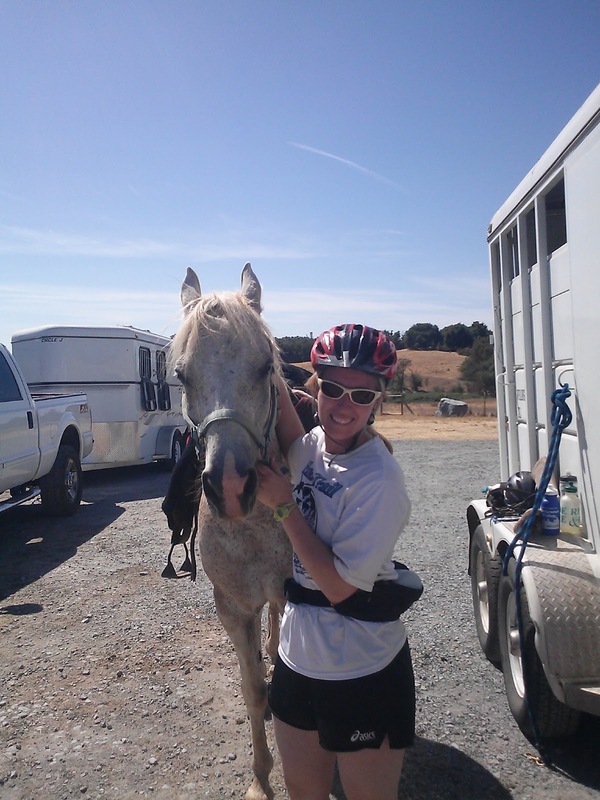 I was writing the post as tongue in cheek – the first pic of me riding without a helmet, in sandals, in a halter and flymask is obviously unsafe….but the pic below with my bike helmet is not much better. There are some situations that I don’t wear a helmet for and they are few and far between. 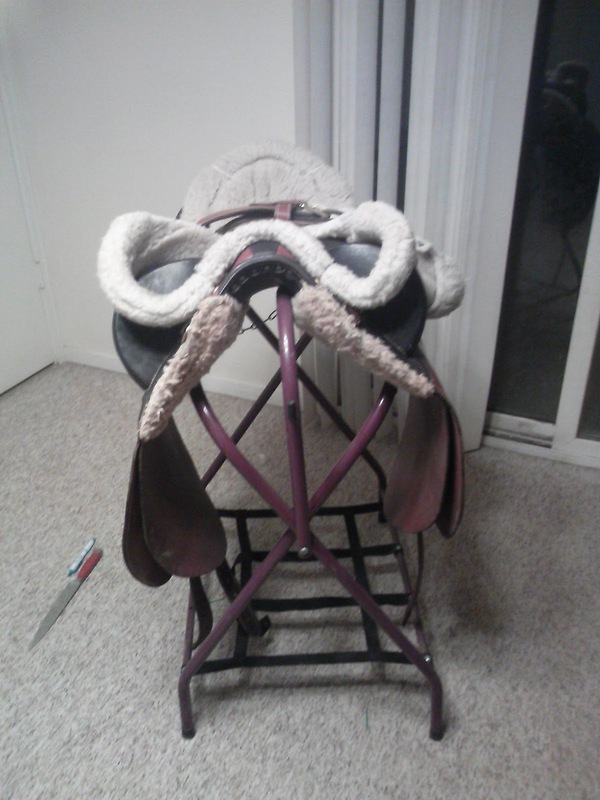 Civil war reenactments are one place (although I do wear a helmet during the practices), and I have a feeling that ride and ties will be similar….unless someone wants to get me a fancy equestrian helmet for christmas that ventilates more like a bike helmet????????? 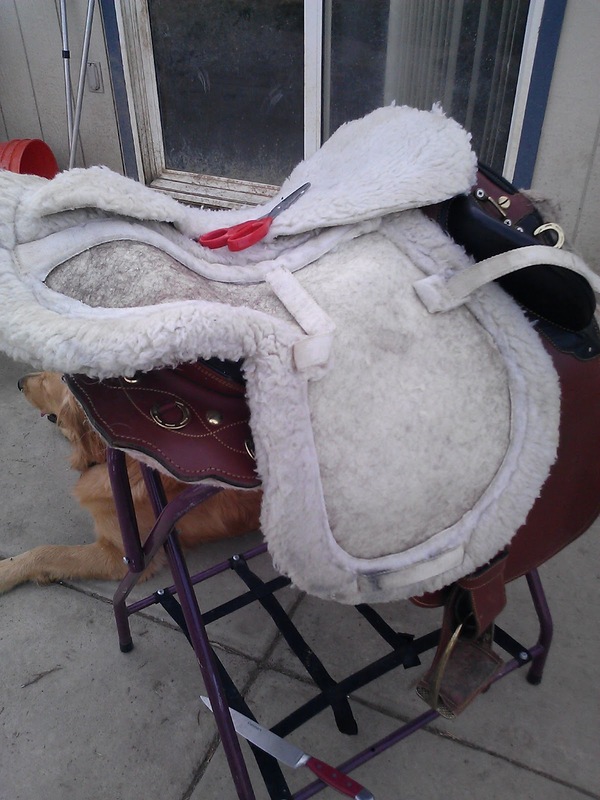 AareneX – can’t hook my helmet to the saddle/stirrup because my partner will be riding when I’m not and having a helmet knock about on the horse or saddle is really really irritating. Not to mention giving it knocks and bumps that aren’t good for it. Taking the time to secure it each time in a way that won’t bounce is too time consuming for the 20-30 switches that will occur in the race. If there are any ride and tie people, or people who have come up with a genius solution for this, I’m all ears!!!!! Carrying the helmet on my arm isn’t an option, and anything that requires a lot of time to secure it isn’t an option. Maybe I can secure to my water bottle belt????? I’m not sure any of my helmets are light enough not to impede my running though.